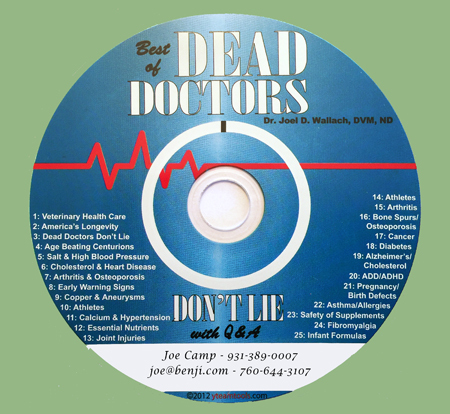 Dr. Joel Wallach had a dream to change the world. Even as a child on the farm he was discovering the value of minerals and nutrition in creating good, illness-free health in animals. As he grew up and studied more, his passion grew, and an entirely new way of looking at health began to emerge. Dr. Wallach’s relentless 45-year pursuit of scientific truth and his persistent willingness to challenge the status quo has enriched the lives and improved the health and well-being of millions of animals, then millions of people. First as a scientist and a vet, then as a physician. Dr. Wallach has autopsied and blood sampled more than 17,000 animals, and more than 3000 humans. His research has been published 75 times in peer-reviewed medical and scientific journals internationally. He is a major contributor to thirteen books, one of which is in the Smithsonian Institute (Diseases of Exotic Animals) and is required reading by leading vet schools. He has traveled to and sampled the blood of people in the planet’s longest living cultures. He has removed more than 900 diseases from the animal world and gone back to school at 40 to become a naturopathic physician so he could prove that the same research that works for animals also works for humans. And prove it he did. And when he got little support from the medical community for nutritional preventive practices, and none whatsoever, from the world of pharmaceuticals, he said, “We will build an army of passionate crusaders and pay them a ridiculous amount of money to share the 90 for Life message with the most advanced nutritional products available anywhere at any price.” And so he has. Youngevity is a publicly traded company with over $140 million in annual revenues and is growing internationally at an astounding rate. Two-time Nobel Prize winning scientist Linus Pauling said, “Every ailment, every disease, every illness can be traced to a mineral deficiency.” Dr. Joel Wallach was listening, and there’s no better person on the planet to talk about his 45 years of clinical research which resulted in the amazing Youngevity program than the good doctor himself.